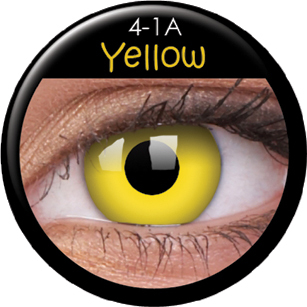 These Yellow Avatar Contact Lenses are wonderful for creating amazing golden yellow eyes. These beautiful contact lenses are an inspiration from the movie Avarat. They completely cover all eye colours including dark brown and make the iris look a little larger and brighter with a beautiful definition. These yellow contact lenses create out of this world avatar eyes and are really bold and stand out. They Last 1 year and are fun freaky eye Contacts which are great for halloween or simply just to transform your overall look. These novelty contact lenses are very comfortable and 2 lenses come in the box. Beautiful luminescent yellow avatar contact lenses look bright and make eyes look more defined.